This is the second in the MJ Holliday series. 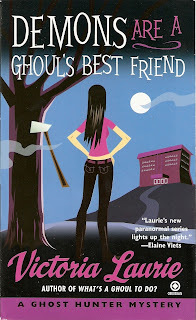 I reviewed the first one, What's a Ghoul to Do?, last year. MJ, Gilley, and Steven are back busting ghosts, this time it's Hatchet Jack who's on their hit list after he terrifies Karen's niece. When the gang arrive at Lake Placid, they find a cold reception from Karen's brother to the dean of the school. No one knows or will admit to knowing who Hatchet Jack was. At first, the dean doesn't even want the ghostbusters on the property, until Karen and her on-again-off-again boyfriend strike up a deal, then they're given one week to find and eradicate Hatchet Jack. On the first night of ghost hunting, MJ finds three little ghost boys, who she feels were Hatchet Jack's victims. MJ's finally able to knock down some of the code of silence shared by some of the residents, gets law enforcement on her side, discover a murder (who people wonder if it's a Hatchet Jack victim), and solves the mystery and everyone goes home happy until the next haunting. I really like this series, even though it has a few pet peeves: lingo and coincidences. I think I mentioned Laurie's use of coincidences in a past review (can't recall which one off hand), however, this one wasn't as bad as the other one. There was only one event tied to a portion of the story rather than a few. The only reason the lingo bothers me (such as two women calling each other "girlfriend" or "girl" when neither one is gay and they're both over 21) is I'm not used to it and I have a personal grudge against the "girlfriend" word, though I'll spare the details. Because this is just a personal view, I'm sure many others are quite comfortable with it and it's not enough to deter me from the next in the series: Ghouls Just Haunt to Have Fun. i work with a 30-something mother-of-two who one day decided she'd start calling her female co-workers (and said with an affected valley-girl accent) "girlfriend!". it definitely has a "forced" feel to it. i think she's searching for her lost youth.